(Left to right) Anne Arp, immediate past president of the Sir Walter Cabinet; Jill Orr, director of development for Arts NC State; Nicole Peterson, executive director of development for the Division of Academic and Student Affairs; and previous Sir Walter Cabinet presidents and members of its Gifts Committee, Barbara Walters, Susan Hunter and Margaret Martin. A longtime, influential statewide organization with close ties to the General Assembly has chosen NC State for its most recent donation. The gift from the nonprofit Sir Walter Cabinet to the university’s Division of Academic and Student Affairs (DASA) will benefit the Student Emergency Fund and support the construction of a welcome table for the lobby at the Crafts Center. NC State established the emergency fund last year to help students impacted by unexpected crises that range from family illness to natural disasters. The fund is part of DASA’s Pack Essentials effort to connect students to vital resources for food, housing, financial and educational security. For financially insecure students, one surprise expense can spell disaster. A sudden illness or unexpected car repair, for example, might lead to a leave of absence or even withdrawal from the university. A grant from the Student Emergency Fund — which provides one-time microgrants of approximately $500 — can keep a recipient on the path to success. The staff of the Crafts Center, which is located on the first floor of Thompson Hall near the Coliseum Parking Deck, is handcrafting the new lobby table from wood harvested from campus trees that had to be removed during the Gregg Museum of Art & Design’s building project. The massive “live edge” slab that will be used for the tabletop is from an oak tree that was over 100 years old. The Crafts Center has been part of NC State since 1954 and teaches classes in wood, pottery, glass, fiber arts, mixed media and more. The center is used not only by students, faculty, staff and alumni but also the general public, so the impact of the Sir Walter Cabinet’s gift reaches far beyond the boundaries of campus. An unveiling will be planned to celebrate the table’s completion. Membership in the Sir Walter Cabinet is open to spouses of leading members of the three branches of North Carolina government – including the General Assembly, the governor and lieutenant governor, Supreme Court justices and Court of Appeals judges, Council of State, Cabinet secretaries and director of the Administrative Office of the Courts – and the presidents of the University of North Carolina and the North Carolina Community College System. Women who hold these offices are eligible as well. The organization traces its start to 1919, before women could vote. Wives of elected officials who had traveled from across North Carolina to Raleigh for legislative sessions would gather near a particular fireplace in the old Yarborough House hotel downtown, renewing friendships among themselves and local women. The group soon gained the moniker of the Yarborough House Cabinet. While the group began with a social element, it always discussed and educated members about issues before the legislature and impacting North Carolina’s residents. According to News & Observer articles of the 1920s and 1930s, the cabinet began to support causes including women’s suffrage, aid for the blind and deaf, workers compensation, better roads and improved prison conditions for women – advocating behind the scenes and in public. In 1923, after the Yarborough House burned, the women moved their headquarters to the new Sir Walter Hotel. Over the years, as women took on more statewide offices, the Sir Walter Cabinet’s focus shifted toward philanthropy. The organization’s stated goal is to contribute to North Carolina and its citizens’ general welfare by promoting interest in related social, legislative, economic and historical causes. Every two years, as one of several traditions, the currently 300-member cabinet makes a monetary contribution to a state-affiliated organization; a committee of past presidents and the current president choose the recipient. 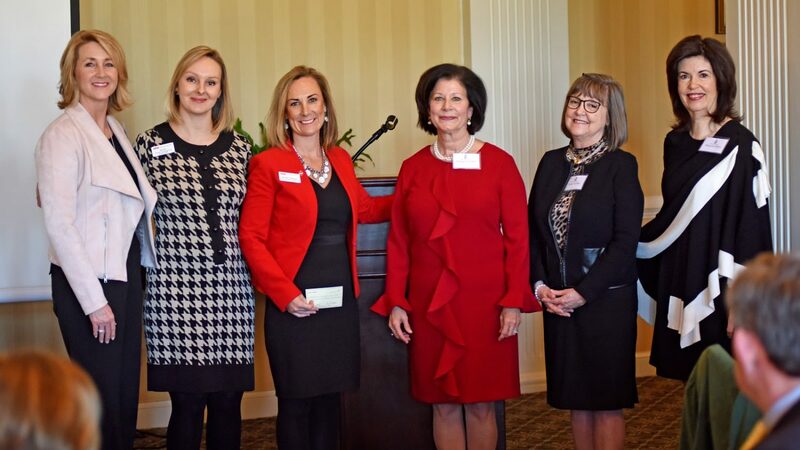 Nicole Peterson, executive director of development for DASA, and Jill Orr, director of development for Arts NC State, formally accepted this biennium’s gift in February during the Sir Walter Cabinet’s biennial meeting at the Carolina Country Club in Raleigh. “We are honored and appreciative that the Sir Walter Cabinet, with its wonderful tradition of serving North Carolina, has made this investment in the success of our NC State students and in our Crafts Center, which provides our community with so many opportunities to pursue artistic passions,” Peterson said. The Sir Walter Cabinet’s past gifts have gone toward projects at organizations such as the North Carolina Museum of Art, the North Carolina Museum of History, the North Carolina Museum of Natural Sciences, the North Carolina Symphony, the State Capitol and Tryon Palace. The group made a previous gift to the Gregg Museum.